Our last post announced a Coursera MOOC starting on October 6th: An Introduction to Evidence-Based Undergraduate STEM Teaching, offered by the CIRTL Network. This post will look at an earlier moment in graduate student preparation for the professoriate – teaching assistantships. Although the face-to-face training is open only to our JHU graduate students, several of the resources are available to the public, including our Teaching Assistant Training Manual. While some of the content is Hopkins specific, there is quite a bit of material that will be useful to anyone in a TA role. There are also videos (scroll to the bottom of the page) that deal with topics such as preparing for the first day, leading labs and evaluating writing assignments. Other videos look at TA – student interactions and suggest ways of dealing with common issues such as grade complaints. If you are a graduate student or faculty member with graduate students at another institution, there is a good chance that there is some preparation for TAs or future faculty available. A quick way to find out is to Google “teaching assistant @your institution’s abbreviation.edu” (e.g., @jhu.edu). If your teaching assistants go by another term, substitute that term in the search. For all graduate student teaching assistants and teachers, there is a terrific resource I want to recommend. 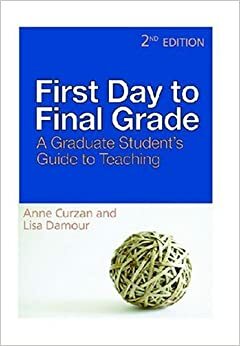 Anne Curzan and Lisa Damour, who were, once upon a time, graduate students at the University of Michigan, have written a comprehensive guide for graduate student teachers – First Day to Final Grade: A Graduate Student’s Guide to Teaching [University of Michigan Press, 2009]. From the book jacket: “First Day to Final Grade: A Graduate Student’s Guide to Teaching is designed to help new graduate student teaching assistants navigate the challenges of teaching undergraduates. Both a quick reference tool and a fluid read, the book focuses on the “how tos,” such as setting up a lesson plan, running a discussion, and grading, as well as issues specific to the teaching assistant’s unique role as both student and teacher.” Although there are many excellent guides to teaching at the university level, a number of which are cited in this book’s comprehensive bibliographies found at the end of each chapter, the focus on the role of the graduate student teacher is what makes this unique.